Morwhenna. The Creative Adventurer: Fancy a Challenge...? Whilst looking for a new desk diary for 2014 it suddenly dawned on me that I could make my own. Well have a go at making my own by repurposing a book. I much prefer having a paper diary than using one online. Call me old fashioned, but I like being able to hold it in my hands and view the weeks and months in this way. I like a hard backed diary with plenty of space to write with some kind of inspirational quotes and beautiful artworks. I also like to make notes, sketch and dream in my diary so it's more than just dates. Take one old book and add in 12 months of exciting adventures ahead! I realised that I already had a 2013 wall calendar I'd not used (not to my taste - and once the days of the week are cut off I can reuse these for 2014), and a book ready to be repurposed. Keeping with the theme from my recent Goals course about re:LOVEing things, as I'm sure you'll be aware how much I like upcycling! So I'm going to give it a go and see what I end up with. After all it will be spending all of 2014 with me! I'm also thinking that the actual act of making will encourage me to be better at planning as I'll be actually visualising how I'd like each month and then my year to be. Will find out. I'll also include my goals as a way to stay motivated and focused on them. Must be aware though when I'm actually distracting myself by making when I'd be better taking those steps to achieve my goals. Which I am VERY excited about! 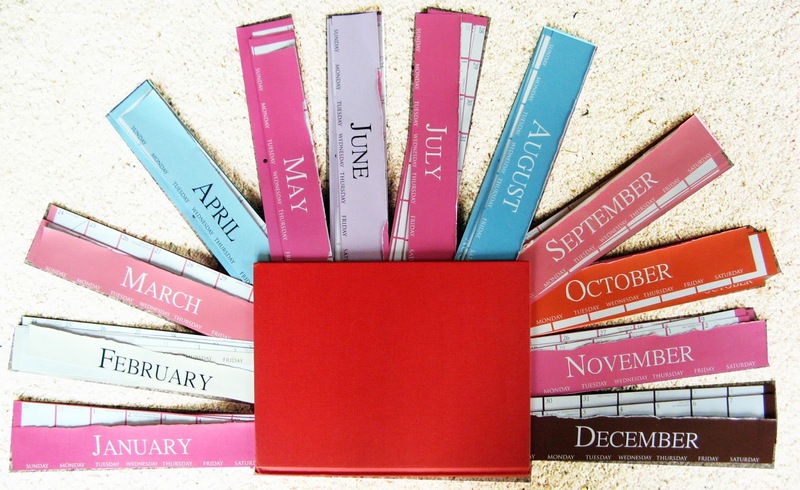 So I'm inviting you to JOIN ME in creating your own personal 2014 diary from an old book. This isn't a course - as I'll be doing it right alongside you, and there won't be any prizes dished out - well other than the satisfaction of having made something unique to you! So what do you say? Fancy it? Share your finished diaries with me and I'll put them here on the blog ;-) And share your progress over on the facebook page ;-) Looking forward to seeing your creative juices flow! p.s this could easily be an on going project into 2014 finishing a few months at a time if you wanted to. A great idea! I may try this too!